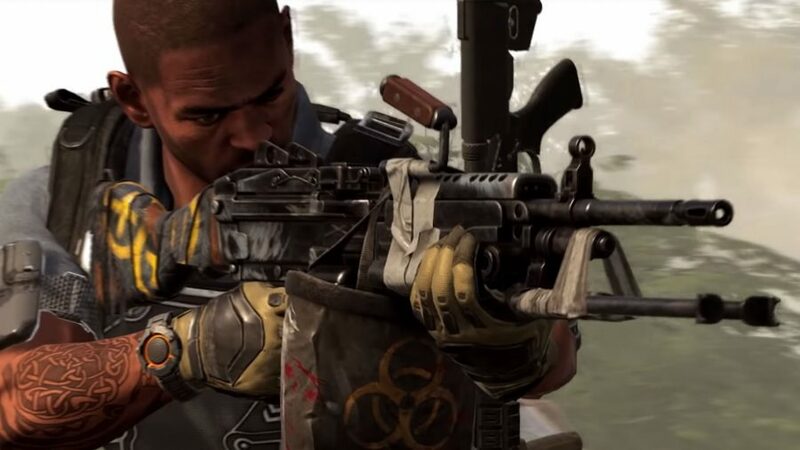 Bad news if you’re still grinding away for the game’s other Exotics, as players have already discovered how to get The Division 2 Pestilence Exotic LMG. We’ve known about the Outcast weapon since the beta thanks to various leaks and datamines, but with the latest patch we can finally check out its stats and start farming it for ourselves. The Pestilence Exotic has released alongside the new Tidal Basin stronghold and the launch of World Tier 5, but oddly enough it doesn’t seem you need to take part in the new content at all in order to get this Outcast LMG for yourself. While an exact farming method doesn’t exist yet, reports from players all suggest that this is the first Division 2 Exotic that will only drop in Dark Zone. Below you’ll find a short guide to the Pestilence Exotic, its stats, and how to get it yourself. We’re still not clear on whether you need to farm this in the Occupied Dark Zone or the standard DZ, but we can confirm we got ours from the more PvP-focused Occupied DZ. After a lot of grinding, we finally have The Division 2 Pestilence in our inventory, but it looks like there are a few ways of farming this – all of them involve the DZ. We got ours by completing as many DZ landmarks as possible in the Occupied Dark Zone, and the weapon itself dropped from the named Black Tusk enemy that spawned in the final wave of foes. It took us a whopping five hours of DZ farming to grab this. However, it is also possible to grab the Pestilence from normal Dark Zones. We don’t know if the drop rate is any different, but it seems most players have found theirs in Occupied Dark Zones. In case you were wondering, the gun is not exactly worth the effort, but you can strip it down for Exotic Components to upgrade your other Exotics. We will update this portion of the guide as soon as the steps to get this LMG are a bit clearer, but that should be more than enough information to set you on your way to grabbing Pestilence.